New site MyTweet16 is the Twitter equivalent of a baby album photo. It’s not rocket science – all it does is show you your first 16 tweets. It is pretty cute though – see your first faltering steps in microblogging, remind yourself what the weather was like in April 08. These are first 16 tweets of great Twitter Lord Stephen Fry. I’m impressed – he jumped straight in there. 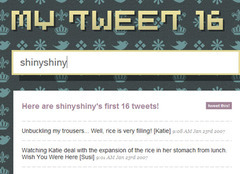 And back in the day, this is what the Susi and Katie were saying on the Shiny Shiny Twitter on 15th Jan 2007. Quick update on that situation: no naked boys anywhere near Shiny Towers right now. I’ve just looked out the window twice. Of course they just chose sixteen for the sweet 16 joke, but 16 is actually a good number, the average first five tweets are people saying “Oh hi, how do I use this?” or “Just getting the hang of Twitter”. In my case the first tweet is “Signing onto Twitter”. Christ that’s dull. True maybe, but interesting, no. You have to start breaking the 6th tweet before before people get interesting and work out how to use the @ function. Ideally MyTweet16 will show you how you’ve progressed – how your life has got more interesting, your twitter conversations faster and funnier. But sometimes the horrible realisation dawns, that you are doing exactly the same things in 09 as you did back in 08. There’s probably an eternal truth in there. My first tweet says something along the lines of “investigating the lump that has miraculously appeared on my eyelid”. Then silence until Christmas. It was April 2008 before I realised that other people were actually using Twitter.